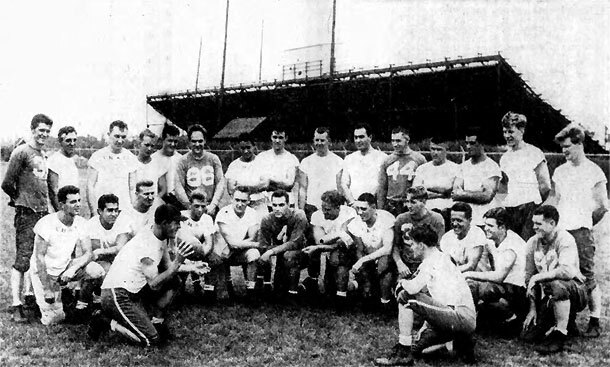 A stronger defensive club but one with less scoring punch than the previous year is what University of Buffalo Coach Frank Clair expected to field during the fall of 1949. Too many fine backs have been lost through graduation to field a squad with the offensive force of the 1948 was his thinking. It was also thought that the success of the season would depend upon whether the team got off to a fast start against their first two opponents Colgate and Niagara. After that, the schedule was much easier. Joining Frank Clair on the Buffalo coaching staff was Wayne Gibson, a former Miami University star fullback. Gibson was hired as backfield coach. Gibson would go on to have a long coaching career in college football. He returned to Athens, OH and served as assistant coach for both John Pont and Bo Schembechler at Miami University. He became the associate athletic director in 1977 and was inducted into the Miami University Athletics Hall of Fame in 1981. In their first game, Buffalo was drubbed by Colgate, for the second year in a row, 32-0. The Bulls rebounded the following week beating rivals Niagara 36-0 in Civic Stadium. But two disappointing home loses to St. Lawrence and Bucknell had the Bulls record at 3-3 heading into November. Buffalo won the rest of their games, outscoring their opponents 85-16, but the damage was done. The season ending record of 6 wins and 3 loses was considered a failure. 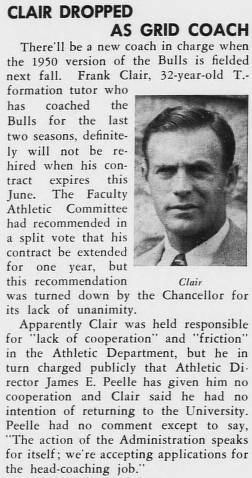 Frank Clair gave his side of the story to the Buffalo Courier-Express stating: “I have nothing against the University of Buffalo. It is a fine institution and I have lots of friends there. But the Athletic Department needs a shakeup as far as I am concerned. Maybe my record (12-4-1 for two seasons) did not measure up. I think it’s pretty good. Any friction was not my fault. Frank Clair would go on to have a long, highly successful coaching career in the Canadian Football League. He was inducted into the Canadian Football Hall of Fame in 1981. “Colgate Defeats UB, 32-0” Buffalo Courier-Express Buffalo, NY, 25 September 1949. “Buffalo Registers Handy Victory Over Niagara, 26 to 7” Buffalo Courier-Express Buffalo, NY, 2 October 1949. “UB Wallops RPI, 26 to 0” Buffalo Courier-Express Buffalo, NY, 9 October 1949. “UB Whales Alfred, 32-6” Buffalo Courier-Express Buffalo, NY, 16 October 1949. “St. Lawrence Upsets Buffalo, 13 to 7” Buffalo Courier-Express Buffalo, NY, 23 October 1949. “Bucknell Rally Defeats Buffalo, 21 to 7” Buffalo Courier-Express Buffalo, NY, 30 October 1949. “UB Whips W & J, 26-2” Buffalo Courier-Express Buffalo, NY, 6 November 1949. “Buffalo Romps Over Rams, 39-7” Buffalo Courier-Express Buffalo, NY, 13 November 1949. “Buffalo Trounces Ohio U, 20 to 7” Buffalo Courier-Express Buffalo, NY, 20 November 1949. There will be a new coach in charge when the 1950 version of the Bulls is fielded next fall. Frank Clair, 32-year old T-formation tutor who had coached the Bulls for the last two seasons, definitely will not be rehired when his contract expires this June. The Faculty Athletic Committee had recommended in a split vote that his contract be extended for one year, but this recommendation was turned down by the Chancellor for its lack of unanimity.